If your home has an air barrier at the exterior sheathing, do you also need an interior air barrier? Airtight roofing underlayment. A Swiss tape manufacturer, SIGA, sells tape and gaskets for sealing the seams and edges of roofing underlayment. These products help builders establish an exterior air barrier at the layer of the roofing underlayment and housewrap. Image Credit: SIGA A gasketed seam. This Swiss builder is installing a special gasket to establish an airtight seal between the roofing underlayment and the housewrap. 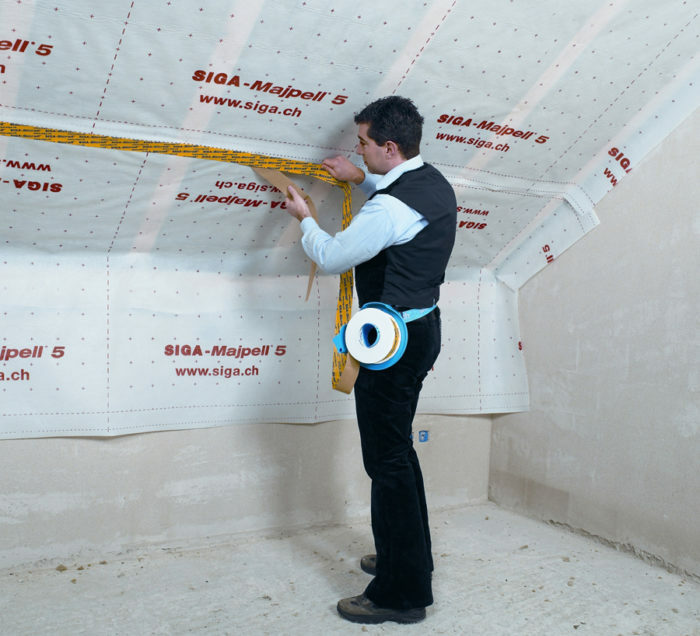 Image Credit: SIGA A second air barrier. Once the exterior air barrier is complete, many Swiss builders install a meticulous interior air barrier as well. This builder is using peel-and-stick tape to seal the seam of the interior vapor-retarder membrane. Image Credit: SIGA Penetrations must be sealed. SIGA sells a special tape to seal penetrations in the interior air barrier. Although building scientists have understood the advantages of airtight construction details for years, few residential plans include air barrier details. That’s nuts. Do the blueprints show where the air barrier goes? where the top plate meets the ceiling drywall. Podcast: Air Barrier or Vapor Barrier? If the day ever comes when most new homes include an air barrier that addresses typical penetrations and the intersections listed above, energy efficiency experts will cheer. That day is a long way off, however. In the meantime, some progressive builders insist that every home needs not one but two air barriers: an exterior air barrier and an interior air barrier. Although this belt-and-suspenders approach is controversial, it has many strong advocates. To understand the controversies surrounding double air barriers, it’s important to explain the two positions. The basic rule of infiltration is “air out always equals air in.” If you have a good air barrier on one side of the insulation, you have stopped both infiltration and exfiltration — so you’re done. It can be on the exterior side of the insulation — for example, using taped housewrap. It can be in the middle of a wall — for example, using spray foam insulation. It can be on the interior side of the insulation — for example, using the airtight drywall approach. If you set a particular airtightness goal — for example, 1.5 ac/h @ 50 Pascals — you can achieve it with any of these methods, as long as you pay attention to penetrations and intersections. Once a blower-door test verifies that you have achieved your airtightness goal, you have a tight house. The exterior air barrier can be omitted above insulation installed on an attic floor. The interior air barrier can be omitted at rim joists. The interior air barrier can be omitted in warmer climate zones (zones 1 through 3). For the most part, these exceptions are due to political compromises rather than important building science principles, so I won’t be discussing the exceptions here. Fiberglass-insulated kneewalls with no air barrier facing the attic. Fiberglass-insulated skylight shafts with no air barrier facing the attic. Fiberglass-insulated exterior walls behind tub/shower units or zero-clearance fireplaces with no interior air barrier. The rationale behind the two-air-barrier principle is that many of these areas — especially ventilated unconditioned attics — are subject to wind-washing or convection. If the builder installs air-permeable insulation like fiberglass in these areas, the performance of the insulation will be seriously degraded unless the insulation is protected by air barriers on all sides. Of course, there is an inherent flaw in the Energy Star Homes mandate for both interior and exterior air barriers — the fact that no technology exists to test the air tightness of each individual barrier. A blower-door test can reveal a home’s air leakage rate, but it can’t reveal whether a home has one or two air barriers. If an Energy Star builder provides a good exterior air barrier, the interior air barrier can be as leaky as a colander — and building inspectors and blower-door technicians will never notice the flaws. In Europe, meanwhile, there is a significant effort underway to train builders to install two air barriers — an exterior air barrier and an interior air barrier — on all new buildings. One strong proponent of this construction approach is SIGA, a Swiss manufacturer of membranes, tapes, and gaskets. According to Patrick Haacke, SIGA’s head of product management, most new Swiss buildings include two air barriers installed with great attention to seam sealing. 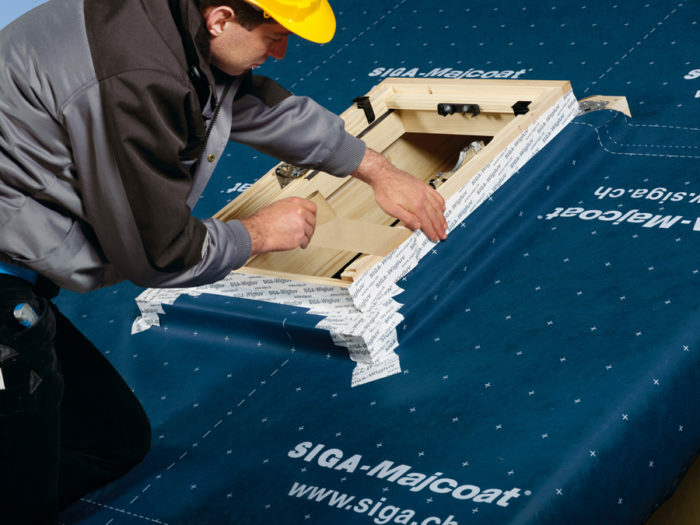 SIGA brochures (and SIGA training sessions for builders) recommend a meticulous series of steps to seal exterior housewrap and roof underlayment seams and penetrations. Once the roof underlayment has been made airtight, SIGA recommends similar air-sealing measures at housewrap seams and wall penetrations. With the exterior air-sealing work (including details to seal the intersection between the roof and walls) complete, one might assume that the Swiss builder would happily call up his blower-door contractor and enjoy his excellent test results. But no — now the builder moves indoors, and repeats all of these steps on the interior. 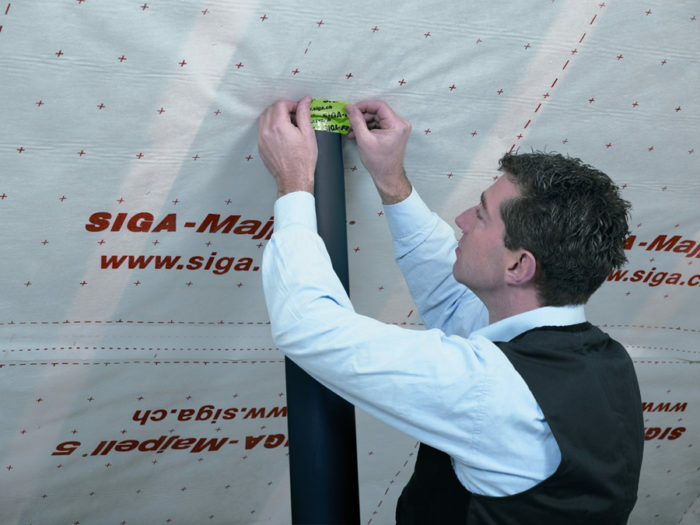 SIGA brochures show a happy Swiss worker (dressed, of course, in a white collared shirt and a black vest) installing an interior membrane (similar to polyethylene, but more permeable). The builder uses special tape (sticky on both sides) along every stud so that the membrane can be attached to the framing without any staples. Then the membrane seams are sealed with a special tape. 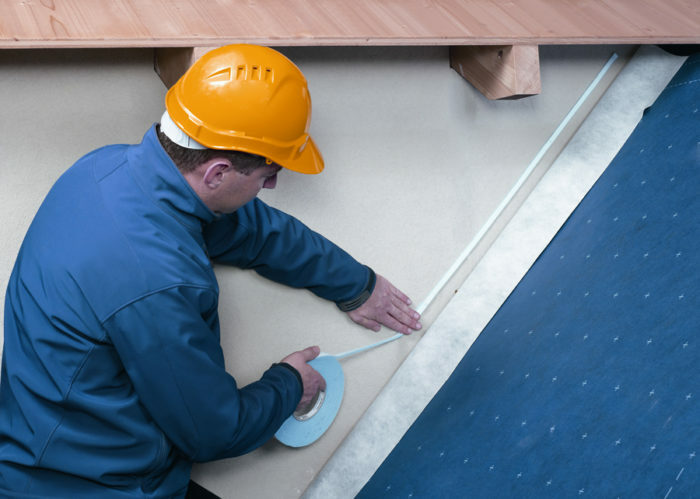 A different tape is used to seal between the ceiling membrane and plumbing vents; still another product is used to seal the seam where a ceiling membrane meets a wall membrane. SIGA also sells tape to seal around floor joists or exposed rafters that penetrate the wall membrane. Of course, tape is used to seal the membrane to windows and to exposed ridge beams. So, are two air barriers necessary? The two barriers are a belt-and-suspenders solution to the problem of builder sloppiness. The two barriers are an attempt to prevent degradation in the performance of air-permeable insulation due to wind-washing and convection. The first reason is certainly defensible. For example, some manufacturers of structural insulated panels (SIPs) now insist that panel seams be sealed twice: once with spray foam, and then later with interior tape. This belt-and-suspenders approach is a direct result of a cluster of SIP failures in Juneau, Alaska, where poorly sealed SIP seams allowed exfiltration, condensation, and rot. The air leakage problem in Juneau was caused by job-site difficulties encountered during freezing weather or rain; difficulties in accessing certain SIP seams; and worker sloppiness. The manufacturers’ response — “we need two air barriers” — makes sense. However, some building techniques don’t need such redundancy. Marc Rosenbaum’s use of the Huber Zip System for roofs and walls, along with early blower-door testing, results in high levels of thermal performance without the need for two air barriers. If you have a good air barrier, how much air moves through your insulation? The second reason — addressing wind-washing and convection currents — is subject to debate. Obviously, wind-washing is a concern when fiberglass batts are exposed at soffits or the back of attic kneewalls. Elsewhere, however — for example, in walls with Huber Zip System sheathing and no interior air barrier — it’s hard to imagine that wind-washing or convection currents are significant. To a large extent, double air barriers are an attempt to respond to the inherent performance problems of fiberglass batts. As more builders choose other insulation materials, there will be fewer justifications for the expense and hassle of double air barriers. Is the interior air barrier used by SIGA actually a "smart" retarder, a la MemBrain? If it is not, I would be concerned about the lack of drying potential inside the wall cavity. A perfectly-detailed exterior should keep bulk water out for a long time, but I would tend to prefer air-sealing details that can handle unexpected situations long after installation. The interior SIGA membrane has an s(d) value of 5 m. According to European standards, that makes it a "diffusion-blocking" membrane -- but not "diffusion-proof." In other words, it's a vapor retarder, not a vapor barrier. It is more vapor-open than polyethylene. It is not a smart retarder; in other words, its permeance does not vary with moisture content. The best point made is low energy buildings do not happen by accident, effort is needed and the details are critical. I am in favor of the 2 air barrier system, one primary, one secondary because it puts the focus on quality for the entire building envelope. Use the right system for a given climate, get the details right, exterior drainage plane in particular and the building will perform well. Your whole argument is based upon the premise that airtight is a good thing because of energy efficiency. My momma always said that a house needs to breathe. We lived in an old farmhouse that was anything but efficient, but it was heated from wood, and never needed air-conditioning because it was always 10 degrees cooler than the outside. So I guess it was more energy efficient than most modern homes. She said that asthma, allergies and other sicknesses could be tied to the airtightness of new houses, not to mention that moisture has no where to go and mold becomes a problem. Studies are proving her right. As I set out to build my own house, I am really pondering these two points of view and trying to find a good outcome. I have heard of people making their house airtight and then installing an air filter that needs to be run constantly and replaced every few months. That seems insane to me. (Doesn't it take electric to run the air filter? and isn't more machinery and more maintenance more work? I don't want to have to change a filter in my house to be able to breathe healthy air!) I would love to hear what you have to say. 1. Mammals breathe to oxygenate their bloodstreams. Buildings don't have any blood to oxygenate, so buildings don't need to breathe. 2. Occupants of buildings definitely need fresh air. If you don't have a mechanical ventilation system, where are you getting your fresh air from? It sounds like you and your momma are depending on random cracks in your building envelope. Random cracks are not a dependable source of fresh air. In your momma's home, air infiltration ranged widely. During the coldest days of winter, the stack effect brought in way too much fresh air. On still, windless days during the spring and fall, very little fresh air entered your momma's house. Sometimes, the air entering your momma's house came from a moldy crawl space -- because that's where the cracks were. Build framing, add sheathing, membrane and siding/roof. Blower door test. Fix air-tightness of exterior barrier while you can still get to it from the inside. Add insulation, add air-tight drywall. Repeat blower door test. Compare results and tweak inner barrier as necessary. Take a completely sealed home that is absolutely airtight. Get the gas exchange through this permeable airtight membrane correct and indeed a home is breathing like our lungs do to deliver oxygen to the enclosed humans and to take away CO2 and other gases including H2O vapor. They will balance across the proper membrane and no electric/mechanical fan ERV/HRV is needed. Would like someone to chime in and tell me the permeance a home would need for this to work. Who can site the rate of all gasses that make up air through all building materials available today or being developed. My feeling is densepacked cellulose held by something better than membrain would do the trick perfectly. I have lived my life in turn of the century homes in a cold climate and it took awhile for me to accept that residential construction should be built air tight and have mechanical ventilation. Part of the reason for my difficulty with the concept was due to the poor performance of the air systems in commercial and institutional buildings; those with all non-operable windows, bad indoor air quality and erratic temperature levels. Residential buildings with operable windows are quite a different scenario as I have come to realize. We use so much energy to heat and cool a conditioned environment for our sedimentary lifestyles. When temperature conditions outside are uncomfortable or harmful to us we need to provide an airtight enclosure to reduce the amount of energy expended to condition the air. As a consequence of this we need to introduce (passively to the extent possible) pre-conditioned fresh air into the interior of the building mechanically for health reasons (mammals need of oxygen as Martin illustrates). The amount of energy expended by transporting fresh air at low velocities is much less than that expended for heating or cooling a conditioned space. There is the concept of 'breathable walls' that many use. This idea includes the important issue of how building assemblies deal with water vapor. 'Breathable walls' is probably a poor choice of words because most the issues surround vapor transmission through a wall assembly not air transmission. However some claim with certain wall assemblies made of natural materials adequate fresh air is able to transfer through the solid wall, but I'm fairly certain this is false thinking and they are merely experiencing leaky construction. 'Negative and positive ions' are often part of the discussion also, one of the two being important to our health. While I have been open to this argument I've only seen vague claims to back it up. Great article. You have an uncanny ability to address some of the more subtle aspects of building science that I was just getting around to wondering about. When we measure the vapor permeance of a building material, we are measuring the ability of the material to allow or restrict the transmission of water vapor, not gasses. Measuring permeance provides important information, but it won't tell you anything about whether a material is good or bad at admitting gasses like oxygen. If you build a structure out of Tyvek, it will be extremely permeable. If you sweat inside your Tyvek tent, the moisture will pass through the tent wall. But you will still suffocate and die unless you include a mechanical ventilation system, because Tyvek restricts air. It seems to me that your hypothetical building -- one that allow the passage of gasses through the building assemblies -- has already been invented. It's called a leaky building. Your proposed method of air testing -- first testing the exterior air barrier with a blower door, then installing ADA, and then testing the building again -- certainly provides information, and tells you whether your interior air barrier is contributing to an improvement in airtightness. But I'm not quite sure how you would set your airtightness goal. "As tight as we can get it?" Or do you tighten the exterior air barrier until you reach 0.6 ach @ 50 pascals? Or do you leave the exterior air barrier a little bit sloppy and leaky, because "we can always hit our goal by tweaking the ADA"? It just seems complicated to me. It's better to choose your air barrier location and aim to do a good job in that one location. Water vapor is a gas. It does pass through "airtight materials." It will seek to go from high concentration to low concentration through a properly permeable material. So will all the other gasses that make up the air that we breath and live in. What I do not know and was hoping someone with the scientific knowledge could do is discuss some permeance ratings for building materials that would allow sufficient exchange of critical gasses to living, mainly O2, CO2, and CO. Nitrogen is the largest component of air but doesn't do much other than give us divers the bends if we don't follow our diving tables suggestions. Also... I second the motion that Martin is invaluable at explaining building systems. As to double air barriers... The Swiss... might be overcompensating for their cheese situation? Here's the deal about inside and outside air barriers at exterior walls from our perspective at ENERGY STAR. One air barrier would be adequate if driving forces were predominantly in one direction. Thus, the exemption for interior side air barriers at exterior walls in Climate Zones 1 thru 3. However, if significant driving forces can be exerted both from outside and inside, as experienced in moderate and northern climates that have both hot summers and cold winters, you need an air barrier on both the inside and outside. This will help minimize likelihood relatively humid air can reach a cold surface and condense inside the wall assembly year-round. Hope this helps the discussion. You write that you are worried that humid air can reach a cold surface and condense inside the wall. You write that in northern climates, there are "significant driving forces" exerted from the inside and the outside that can introduce humid air to cold surfaces in the wall. So, let's talk about a house with an air barrier at the wall sheathing and roof sheathing. It's been blower-tested to 0.6 ach50. What driving force are you talking about that moves humid air into the wall cavity? There's diffusion, of course -- but diffusion has nothing to do with moving humid air. How does the humid air get into the wall? Not the stack effect; we've established an air barrier, remember. Not the wind; we've established an air barrier. You're right; water vapor is a gas. But the reason we build houses out of materials that stop the wind is that we really don't want to have a windy living room. Cheesecloth allows the wind to enter, so if you build your house out of cheesecloth you'll get plenty of oxygen. I prefer to live in a house that stops the wind. I can open the windows when I need fresh air, or operate a mechanical ventilation system if I prefer. What does Energy Star think about a Rigid Exterior Air Barrier Strategy such as Marc Rosenbaum has employed? It seems to be "doing the job" of resisting the driving forces from either direction. How does the humid air get into the wall? How about convective loops?. An airtight exterior won't stop convective loops from forming if there is a path from the warm interior air to the cold side of the insulation. Of course, if the bulk of the R value is exterior to this "exterior" air barrier, then convective loops shouldn't be a problem either. ha haa.. yaa have me smiling Martin. OK... what you are saying is you don't know any more than I do about what perm a material might have that would make a home a sealed but livable space. I know, I am pushing to a knew area of thought with this. But... others are also working on this. I am not against HRV/ERV use... but I bet there are alternatives other than cheese cloth. And my main point it this; Membranes can pass enough gas to allow humans to exist within. That's what our lungs are doing everyday. And they are airtight. When not airtight one needs surgery! If the wall is poorly constructed, a convective loop is theoretically possible. If you're building a high-performance home, however, you are unlikely to be using materials that allow convective loops. So it appears that these expensive double air barriers are just a response to the fiberglass batt problem. Imagine a wall with cold sheathing (because the builder didn't use exterior foam) and fiberglass batts between the studs (because the builder didn't want to use cellulose). If you have a hole in the drywall near the top of the wall, some interior air can move into the wall; then it can filter through the fiberglass, find the cold sheathing, drop to the bottom of the stud bay, and look for another hole near an electrical outlet. It's all possible, in theory -- but if you have an impeccable exterior air barrier that eliminates exfiltration, not much air will be moving in such a loop. If you change just one or two things about the wall -- if you include foam sheathing or switch to cellulose insulation -- the likelihood of such a very small convective loop drops to near zero. An envelope can be airtight only if its consists of ONE undisturbed airtight layer enwrapping the whole volume. They are not saying that you can not have two... but rather you must have ONE. I think the key word is "undisturbed". You basically say that, if you have a good interior air barrier or fairly airtight insulation like dense-pack cellulose then convective loops won't be a problem. But isn't this an argument in favor of a good interior air barrier? Your other claim -- that an exterior air barrier will somehow prevent or reduce convective loops -- just doesn't make any sense. Convective looping is based on air paths that connect the warm inside air with a cold surface and a way for the cooled air to get back into the living space. There is no need for any exterior leakage connection. So if I put the air barrier on the exterior, there's no need for any sort of air barrier on the interior? I could, in theory, leave the wall exposed without drywall? Though I can't debate this scientifically, I am having a problem with the one exterior air barrier approach. Especially when we are talking about homes in cold climates. I look at the exterior air barrier as something to stop wind and condioned air from infiltrating/exfiltrating the home, and the interior air barrier as something to protect warm moisture-laden air from reaching a cold condensing surface. To me a double air barrier would also help prevent the diffusion of smells from the wood framing to the interior of the house when renovating old homes. The question is what kind of "plastic" should we use.? I have seen a lot of opposition versus using PE sheeting. How about Tyvek? I understand that it allows moisture to travel so wouldn't it help the house dry through the inside while stopping the smell? SIGA products don't seem to be available in the US. I looked into the data sheet for the Majpell and I am not quite clear what it is. Any suggestions? 1. How much of a problem is convective looping with well-installed fiberglass batts (there has been a lot of debate on this issue over the years)? 2. How much of what people refer to as "convective looping" is really something else (usually involving infiltration and exfiltration)? 3. Is it really necessary to go to SIGA-literature level air sealing to limit convective looping problems? The answer to your question is MemBrain, not Tyvek. 1) not much, if they are well installed. The key question is more about the "well installed" part and I think that's part of the justification for the interior air barrier. I don't really know what the typical energy savings might be from the interior air barrier -- I would guess not a lot in most cases -- but I think reducing the likelihood of moisture problems in colder climates .may be sufficient justification for paying attention to this,. You're quite right; it is possible to build two complete air barriers and, as I described, test them but it's a complicated exercise. So one air barrier it is. But where? From a purely practical point of view it has to be external - wrapping the outside of a box is easier than wrapping the inside of a box. Do it early and protect it with rainscreen siding and a roof. Test it and fix it. Hide it with internal insulation and drywall and forget about it - happy in the knowledge that it is away from rain and UV and most of the wind. The people living in the house can then live in the house - put up pictures, run extra wiring, move the bathroom and generally move stuff around in a major or minor way. None of this activity is messing up an ADA air barrier because there isn't one. The external air barrier is outside the insulation so it's going to get cold - so it had better be vapor-permeable (at least in parts of the world which are HDD-dominated). All of these systems rely on adhesive tapes to seal the joints between membrane layers or between the membrane and the structure. Every tape that I am familiar with has a usable life period after which the adhesive has degraded too much to adequately stick. Eventually the adhesives lose all their strength adn taped joints fail. Have you seen any claims as to how long the adhesives on these construction tapes (Tyvek, SIGA, etc.) will last? When I met with a representative of SIGA, he informed me that SIGA tapes have no VOCs. Since there are no volatile organic compounds to evaporate, SIGA adhesives (he claimed) do not dry out like some competitors' adhesives. I know from personal experience that butyl adhesives are extremely long-lived. I know of one study of air barrier longevity. A 2004 Canadian study by Gary Proskiw and Anil Parekh found little evidence of air-barrier deterioration after 14 years. "A recent study by two Winnipeg engineers, Gary Proskiw and Anil Parekh, provides reason for optimism. In December 2004, Proskiw presented the study,“Airtightness Performance of Wood-Framed Houses Over a 14-Year Period,” at the Performance of Exterior Envelopes of Whole Buildings IX conference in Clearwater Beach, Florida. "Proskiw and Parekh compared blower-door results for 22 Winnipeg houses that have been extensively studied since they were built in the late 1980s. Blower-door tests were performed at all of the houses soon after completion. Follow-up testing was performed periodically on the houses, with the most recent blower-door tests performed in 2000. • Nine of the houses had polyethylene air barriers, with poly seams sealed with [Tremco] acoustical sealant. • Thirteen of the houses were sealed with gaskets using the advanced drywall approach (ADA). "The houses, all completed during the late 1980s, were very tight, with original blower-door results averaging 1.14 ac/h @ 50 Pa. Measured again in 2000, the average airtightness of the 22 houses had deteriorated only slightly, to 1.45 ac/h @ 50 Pa — still below the stringent R-2000 standard of 1.50 ac/h @ 50 Pa.
"Comparing the houses with polyethylene air barriers to those with ADA air barriers, Proskiw and Parekh noted that the houses with polyethylene air barriers showed slightly less deterioration in airtightness than the houses with ADA air barriers. "During the 2000 site visits, Proskiw and Parekh looked for leaks. They determined that most of the observable air leakage was occurring at accessible locations not directly associated with either the polyethylene or the ADA portions of the air barrier systems. Some of the leaks were at floor drains, around doors and windows, and at mechanical and electrical penetrations through the envelope. During his presentation in Florida, Proskiw described these leaks as “basically, just old weatherstripping,” noting that most of them could be easily remedied. "These results were especially encouraging in light of the fact that 18 of the houses enrolled in the study suffered significant vibrations when an environmental cleanup project required the excavation and removal of contaminated soil from the homes’ back yards." It seems like much of this discussion about air barriers revolves around new buildings, or buildings that are undergoing a gut remodel, or chainsaw remodel for that matter. I think there is a case for working toward establishing an effective air barrier on both sides as opportunites present themselves in existing homes. We need some great problem solvers in the field to tackle these interesting issues on the millions of existing homes. In the end we can judge how effective our efforts are by change in annual utility bills, along with the homeowners preception on the changed enviornment that they live in. Great article Martin. All products are available here for shipment anywhere in the US and we are happy to help with product and technique questions. The only sure way of reducing your utility bill is to reduce your own consumption significantly and don't tell anyone else how you did it. Their continued high consumption will subsidize your bills. This is not likely to work out well environmentally. SIGA tapes and gaskets are sold in Europe but not available in the U.S.
Gaskets similar to those sold by SIGA are available from Conservation Technology in Baltimore or Shelter Supply. U.S. builders can use a variety of tapes, including ZIP System tapes, housewrap tapes, and peel-and-stick butyl tapes, to achieve airtightness using the SIGA approach. Whether or not these tapes are the same quality or will have the same longevity as tapes manufactured by SIGA remains to be seen. I will be writing a future blog on air sealing tapes and gaskets. Yes, I'm aware of that. But you are responding to a comment posted in 2010. Back then, Siga tapes were not yet available on this side of the Atlantic Ocean. I worked in construction for over ten years and nothing leads to failure faster than poor workmanship and cutting corners. Every SIPS manufactures says the same thing about their product. The panels have to stay dry to be effective which means you better be good at what you do and have a plan in place to get the job done correctly using that particular system. Additionally, a commitment to thoroughness is a requirement. Bad process. Bad results. There was time in our History when building it right the first time was a fact of everyday life and then along the way we got all these experts telling us how to build better and truth is you need hands on experience to figure that out as opposed to a degree in "THE THEORY OF'. Good point to rise whether you need interior air barrier or not. Good recommendations for that. Expanding foam insulation is applied by spraying it on the desired surface. . Insulation must be installed where air cannot flow through it. At least one side of the insulation must be installed against an air barrier such as drywall. Because insulation works by using trapped, non-moving air, any air movement renders the insulation practically useless. Insulation must be installed according to manufacturer's instructions; otherwise it will not be effective. Give me air tight construction (less than .1 AC/Hour) and I can give you clean and healthy air (displacement ventilation) at the least cost (energy efficient). Make it real easy, use Quality ICF's with great thermal break details and Viper Vapor Barrier. You guys make it sound like it is difficult or Rocket Science to build a great wall. It is easy (and economical) to build almost any building 3-10 times more energy efficient than 95% of them currently built. You claim you can build a house with an air leakage rate of "less than .1 AC/Hour." Do you mean less than 0.1 ac/h at 50 Pascals? Is this verified by a blower-door test? That would mean that your houses leak at a rate that is less than 1/6 of the rate of a house that meets the Passivhaus standard. That's tough to achieve. It may not be rocket science, but it takes more than ICF walls to achieve that. Perhaps your decimal point is misplaced? Great discussion! This is just one more reason why GBA is the best! We build in climate zone 4 (the worst!) We have hot, high humidity in the summers (Right now!) and cold, dry winters. In the not too distant past, we had to work hard to overcome shortfalls in building products by incorporating air barriers and different builders did it different ways (most had no idea even why). The positive side is programs such as Energy Star and Builders Challenge, etc. are leading to better components to address major issues such as these. Improvements in insulating materials and thier application and even advances in components such as SIPS are making it easier for "us practitioners" to address these issues. Keep the discussion going as it keeps getting better! Ok, rookie question here... Assume there are 2 barriers, like polyethylenye (as an air and moisture barrier), and Tyvek (air but not moisture barrier), which should I put inside, and which outside? In colder climates, from what I read sofar, tyvek on the inside, and polyethylene on the outside, and in warmer climates reverse that. (warmer side gets the tyvek). Is this correct? Now as second question, where is the 'changeover' (by climate zone, or other measure)? I wonder, with some PHI folks in discussion saying that SIP construction using OSB sided foam, is sufficiently impermeable to be considered an air barrier, would anyone recommend extra (interior taped plastic sheeting, and exterior house wrap taped) on top of each sides of a SIP constructed structure? As far as Tyvek and poly are concerned, you have it exactly backwards. The traditional recommendation for builders in cold climates was to install poly on the interior and Tyvek on the exterior. However, that recommendation is obsolete. Unless you are building in colder parts of Canada or Alaska, you shouldn't be using interior polyethylene. When Sunshine Drives Moisture Into Walls. Two barriers to prevent condensation? Would the two-barrier approach help with condensation issues though? 1) Internal barrier to prevent condensation when warm, humid inside air meets cooler air in the wall cavity in winter; 2) External barrier to prevent condensation when warm, humid outside air meets air-conditioned space in summer? Maybe I'm confused about air vs. vapor barriers? I read the entire article, but not all the comments. Sorry if this has been addressed elsewhere. Thanks! Yes, More than ICF walls, special attention to all the envelope details (Really Good Contractors) is important. Vapor barrier is not needed on the ICF but everywhere else it is (floor slabs and any wood frame). I like ICF's for the roof also, but for those that like wood trusses I spec taped 10 Mil Viper Vapor Barrier, not violated in any way other than maybe a few sealed wire holes (all ceilings are stepped) for mechanicals, and of a minimum of 2.25" High Density EPS foam sheet under trusses with a layer of HD spray foam above with anything good (no fiberglass) above that. Use great doors and windows like Serious fiberglass 925's and all penetrations are detailed air tight. Ventilation (including bath exhaust) is displacement through a Lifebreath HRV (airtight PVC ducting with dampers and night time bypass cooling) with built in dehumidistat and also use Thermastor Digital controlled Ultra Aire 65 for Dehumidification (UA 65 uses central return with HRV fresh air supply for delivery). 1. OSB is, indeed, an air barrier. Of course, the seams between adjacent panels of OSB (or adjacent SIPs) must be sealed in order to have an air barrier. 2. Interior polyethylene is not required with SIPs that have properly sealed seams. If a builder is worried that the seams may not have been well sealed, he or she might decide to install poly as a redundant interior air barrier. I don't recommend this approach, however. Taping the interior seams makes more sense. 3. Exterior taped housewrap over SIPs is not an air barrier; it is a WRB (water-resistant barrier). 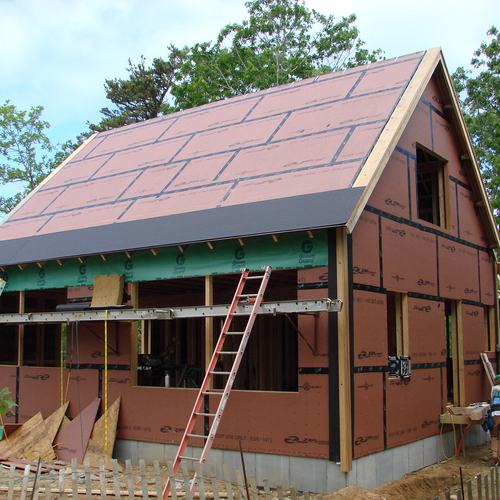 The purpose of a WRB is to protect the exterior OSB from wind-driven rain that gets past the siding. You are right that condensation within walls is usually a sign of a defective air barrier. The moisture piggybacks on exfiltrating air (during the winter) or infiltrating air (during the summer) and condenses on cold surfaces in the wall. It's also possible for vapor diffusion to lead to condensation problems, especially in summer. The point of this article is to raise a question concerning the need for two air barriers. In theory, if you have one good air barrier, you have stopped all air movement. In most cases the second air barrier is unnecessary. The exception would be a wall without exterior foam insulation that is insulated between the studs with fiberglass batts. word on the street is SIGA will soon be available in the u.s. In conventional construction I think the key is limiting air movement in loose fill insulation along with controlling air movement through the envelope. If the interior or exterior details make this sealing process to difficult then 2 barriers are necessary. Use vapor barrier (if desired for one layer) to keep the humidity where you want it and can control it. Does any one agree with that? I'm not sure what you mean by a vapor barrier. If you are using the term in opposition to vapor retarder, then I presume you mean interior poly. I usually recommend against interior poly in all but the coldest climates, because interior poly limits a wall's ability to dry to the interior. To control vapor diffusion, all you need is vapor retarder paint. Remember, though, that a vapor retarder is not an air barrier. To create an air barrier on the interior of a wall assembly usually requires gaskets or caulk under the perimeter of the drywall. Spray foam. An air barrier?? I was wondering your thoughts on relying on spray foam for an air-barrier. I have been noticing a number of problems with spray foam, and recently attended a week long Infrared training and that confirmed my concerns that spray foam is not always the ultimate insulation. There are a number of factors in the quality of the job. Biggest problems are environmental conditions, and installation quality. I am guessing that in years to come, there will be a host of rot problems with spray foam jobs as they concentrate exfiltration in a few specific areas similar to SIP problems. As I'm sure you know, spray foam insulation is only one component that can be used for an air barrier system. You still have to address many areas of the envelope that spray foam doesn't reach. I don't think that spray foam "concentrates" exfiltration into areas with air-barrier flaws any more than any other air barrier materials do. If you have flaws in your air barrier, that's where the infiltration and exfiltration will occur -- regardless of your materials. Even in homes without spray foam, this is true. The flaws are where the air goes! Martin, concentrated moisture issues is one thing that Brownell did tell me he was dealing with in his home designs. When a home is sealed as tight as his ours... the only place air does transfer is at the few leaks. You are half right and half wrong my friend. Contact Brownell and he can fill you in on actual experience. I stand by my statement. I wrote, "I don't think that spray foam 'concentrates' exfiltration into areas with air-barrier flaws any more than any other air barrier materials do." If you have a good air barrier with just a few flaws, that's where the leaks will be. If you have a hole that allows stack-effect exfiltration during winter, condensation on cold materials is certainly possible. But that is not just a spray-foam problem, as Allan Bullis was implying. The exact same phenomenon can occur if you use the airtight drywall appraoch in a home with no spray foam whatsoever. The solution, of course, is to reduce air barrier flaws. A blower-door test is a good way to achieve that. Nobody builds much tighter than Bruce and his double layer foam. And after a blower door run all homes still leak. At that point we have to deal with how well the home handles moisture going through the leak. That's all am trying to say. I think we agree on all points possibly? A great article and many excellent comments. My concern is fairly basic and doesn't seem to have been addressed. Every house ever built moves, settles, cracks, shrinks, expands, incurs damage, etc... over time. An airtight house today will not be so 15+ years in the future. I see a concern over "airtight" spaces trapping moisture in spaces they would otherwise have not, leading to unanticipated problems down the road. 1. You wrote, "An airtight house today will not be so 15+ years in the future." Research data do not support your claim. See my post of July 19 at 11:37 a.m., in which I quote at length from a report on the research of Gary Proskiw and Anil Parekh on air barrier longevity. 2. In response to your "concern over airtight spaces trapping moisture in spaces they would otherwise have not, leading to unanticipated problems down the road": of course it is important for every wall assembly to be able to dry out. 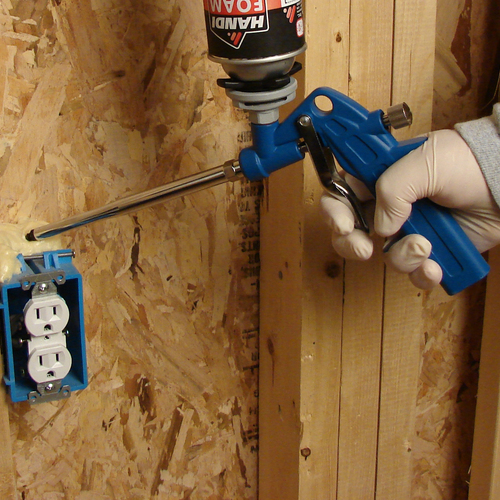 Just because a wall assembly is airtight doesn't mean it can't dry. Drying occurs by evaporation -- in other words, vapor diffusion. This vapor diffusion can easily occur through permeable (though airtight) components like drywall. Thank you for covering this important topic, Martin - It was great to see the points you made on the need for two air barriers with SIP seams and why it is so important. Unfortunately, many people do not understand that proper sealing within SIP seams is not simply an energy efficiency issue but also a structural issue. The fact that moisture can and does become trapped within improperly sealed SIP seams and causes eventual rot due to the vapor drive from the interior and the exterior is an extremely important issue that does not get enough coverage. I recently saw that the DOE references an article on their SIPs reading list that you wrote in 2003 that is called "Problems with Juneau's SIP Walls." I have searched for a copy of the article without any luck. Any suggestions on obtaining a copy of it? As far as I know, the article I wrote for EDU in 2003 is not available on the Web. You may be able to find the article in a good academic library. Does anyone really trust ADA long term? Just my opinion as a longtime remodeler: Homeowners put many many holes in the drywall over the years. Would a homeowner's manual or a website or another form to sign at closing or ANYTHING prevent this behavior? Heck, no! Unless you are talking about a frat house, where irresponsible college students think it's funny to punch holes in the walls with their fists, most homes do not end up with significant holes in the drywall. Hanging a few pictures will not create enough air leaks to significantly affect a home's airtightness. Martin admits in his blog, "the distinction between “airtightness” and “windtightness” escapes me". And then later states: "Exterior taped housewrap over SIPs is not an air barrier; it is a WRB (water-resistant barrier). The purpose of a WRB is to protect the exterior OSB from wind-driven rain that gets past the siding." The difference is quite clear. The exterior of all houses are required by code to have a Weather-Resistant Barrier, which prevents gravity-powered and wind-powered and surface tension–powered liquid moisture from penetrating into the structural envelope and serves as the second line of defense - after the cladding - against the ravages of weather. A non-perforated polyolefin WRB (like Tyvek or Typar) does meet the requirements of the American Air Barrier Association (≤ 0.004 CFM/SF @ 25 mph wind) for an air barrier material, and with taped seams should easily meet its requirements (≤ 0.04 CFM/SF) for an air-barrier assembly. To meet the standard for an air barrier enclosure (≤ 0.4 CFM/SF), would require integration and continuity with all other elements and sides of the structure. And code requires that houses have an air barrier that substantially limits air movement through the building envelope, determined either by visual inspection or blower door test (IECC 402.5.2). In response to Allan Bullis' concern about the quality and durability of spray foam as part of an air barrier assembly ("I am guessing that in years to come, there will be a host of rot problems with spray foam jobs as they concentrate exfiltration in a few specific areas similar to SIP problems"), Martin says, "I don't think that spray foam "concentrates" exfiltration into areas with air-barrier flaws any more than any other air barrier materials do" and then "But that is not just a spray-foam problem…The exact same phenomenon can occur if you use the airtight drywall appraoch in a home with no spray foam whatsoever". What Allan was referring to (and I've brought this up many times) is both the problem of quality control in applying a catalytic, 2-part chemical in environmentally uncontrolled conditions AND the long-term integrity of a rigid foam adjacent to wooden framing which is constantly swelling, shrinking and moving. This is quite different from the issues with initial installation that might plague other systems, such as ADA. If small spaces open between spray foam and framing, multiplied by the thousands of linear feet of such interfaces, then air movement will be concentrated right where it will do the most damage: adjacent to structural wood with a direct path to the cold sheathing. I fully agree with Allan that, in years to come, we will discover the problems of relying on plastic foams to seal our homes, guarantee long-term durability, and maintain a healthy indoor environment. Similarly, when Jim from CT states his concern that "Every house ever built moves, settles, cracks, shrinks, expands, incurs damage, etc... over time. An airtight house today will not be so 15+ years in the future", Martin responds (again) with an old Canadian study of the long-term air tightness of homes with either polyethylene or ADA air barriers. 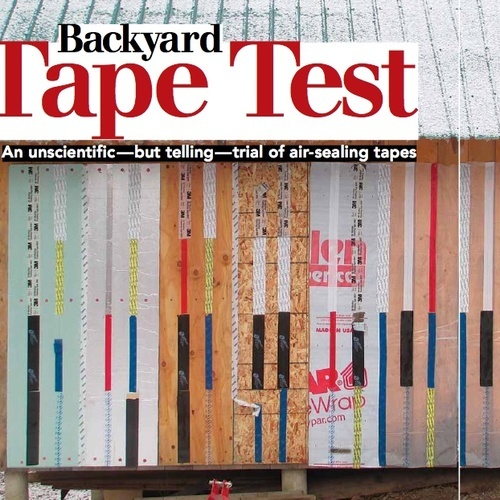 Martin offered this study both in answer to Don's concern about the longevity of tapes and Jim's more general concern about deterioration over time of any system, when the study didn't address either tape or spray foam or the ZipWall or any of the more current approaches to air tightness that are being discussed. Finally, Martin's assertion that "Drying occurs by evaporation -- in other words, vapor diffusion" is only partly correct. Just as there are numerous pathways and forces that contribute to wetting, there are a number of ways a structure can dry, including bulk drainage, capillarity, liquid diffusion, vapor diffusion, and convection. Evaporation only changes the energy state of water, but does nothing in itself to move it. The more tightly we seal a structural envelope with non-hygroscopic and impermeable materials, the less potential for bulk drainage, capillarity, liquid diffusion and convection. It is because of the methods and materials that are commonly used today that there is no drying potential but by vapor diffusion, and that is typically limited to a single vector direction and restricted by vapor semi-impermeable layers with very little energy flux to drive it. While some might consider a double air barrier a "belts-and-suspenders" approach, I would say that a redundantly safe approach requires limiting convection from the predominantly-warm side (inside in a cold or mixed climate, outside in a hot/humid climate), and allowing maximum hygric redistribution (hygroscopic materials, such as wood and cellulose) and maximum vapor permeance in the predominant direction of vapor drive (outside in a cold climate, inside in a hot/humid climate, both sides in a mixed climate). Most of the "green" thermal/air/vapor systems today use only the tight belt of hermetic seal, and ignore the elastic "suspenders" that are part of a breatheable, natural materials home. While doing the trim in an "air tight" house in MN, I watched the granite countertop installers give themselves some "wiggle room" by cutting through the drywall and poly with their sawzall the entire length of their counter. Is it reasonable to expect that these installers should know the refinements of building science? I am concerned that some wall assemblies have become so sophisticated that they are too easily compromised. Q. "Is it reasonable to expect that these installers should know the refinements of building science?" A. Yes -- especially in Minnesota! At many job sites, subs aren't allowed on site until they have had the concept of an air barrier explained to them. i am kind of late getting in to this discussion but I was always told that a home had to "dry out" before you could continue with the interior work. I might have missed it but at what point do you complete the interior air barrier, assuming that the exterior air barrier was completed first? And the article mentions air barriers only. Does this means there are no vapour barriers? I guess I am looking for a little more detail on construction timing as to when can you actually install the interior air barrier. FYI, I live in Edmonton, AB. Is this a more "northerly part of Canada"? An air barrier does not have to be impermeable to water vapor. In fact, air barriers that are vapor-permeable are usually preferred over air barriers that are vapor-impermeable. In other words, a well designed wall should still be able to dry out, even if it is virtually airtight. Walls can be designed to dry to the interior, dry to the exterior, or both. Due to the miracle of evaporation, this drying-out process can continue even after the air barriers are complete. Very damp construction methods require special care, of course. The classic example is damp-spray cellulose insulation. This technique introduces so much moisture into framing cavities that builders need to be sure that the cellulose has had a chance to dry out before covering the cellulose with drywall. Edmonton, Alberta is very cold. But you don't need me to tell you that. Are there any updates in the past 8 years to this debate of one vs two air barriers?? We're building a home in northern VT. We're trying for a tight house but also have a very tight budget. We're attempting to meet an Efficiency VT certification of < 2 ACH50. My plan was one exterior air barrier of taped CDX. A number of higher end efficiency builders say I really need an additional air barrier (air tight drywall or smart membrane on inside of walls). I have the complicated nature of drywalling around a timberframe that is to the inside of a 2x8 DPC wall so air tight drywall seems difficult. One builder recommended I go with Henry Blue Skin to the exterior and that would be tight enough to be my only air barrier. It's very expensive and I'm wondering if it's worth it if I'm very diligent in taping all CDX and sealing problem areas to the outside. Wouldn't that be sufficient? Any new information on this subject? Or thoughts/recommendations? Thanks! I wasn't sure what a "DPC" wall is -- but after some head-scratching, I guessed "dense-packed cellulose." Did I guess right? "Drywalling around a timber-frame" raises all kinds of worries -- lots of attempts to do this over the past 40 years have resulted in leaky wall assemblies. You had better describe your assembly in more detail. 1. In addition to your timber-frame, do you have studs? 2. If you have studs, to you have a continuous stud wall on the exterior of your timber-frame? Or do you have short sections of stud walls between each post? 3. If you have a continuous stud wall on the exterior of your timber-frame, are you planning on installing a continuous air barrier between the exterior of your timber-frame and the stud wall? My name is Ryan. And yes, a dense-packed cellulose wall. There are 2x6 stud to the outside of the entire timber-frame. They have rough-sawn 2x2s that run horizontally to minimize thermal bridging and provide for a deeper cavity. The plan for drywall is the sheetrock will slip behind the braces (which have been offset 3/4" from the outside) and into a 5/8 channel that was routered in all the edges of the posts and beams. I have pretty much abandoned the idea of air-tight drywall for the complicated nature of drywall around a timber frame as you say. And I missed the opportunitiy to install and air barrier between the timber frame and stud wall. So I'm hoping that one air barrier to the outside will be sufficient. At the base of the building the 2x6 wall assembly extends beyond the mudsill but I am curious of how to air seal this transition. Below is a ICF basement with Soprema waterproofing. One thought was to have a 12" tape connect the CDX to the Soprema. Plenty of other questions too! You're in a tough position. The time to install a good interior air barrier (which in your case would have been installed between the exterior of the timber frame and the stud wall) has evidently slipped away, and now it's too late. You will have lots of opportunities for unexpected air channels through your 2x6 wall assembly -- as you point out, air can enter at the bottom plate, which is evidently cantilevered over open air, travel through the studs, and exit near cracks at the top. Air can also enter your wall cavity through cracks between your timber posts and the drywall: these are impossible seams to seal, even with routered 5/8 inch channels, because your posts will shrink, twist, and check. You don't have much choice now but to buy lots of high-quality caulk, high-quality tape, and cases of canned spray foam, and do the best job you can. Good luck. Still wondering if there any updates in the past 8 years to this debate of one vs two air barriers?? I realize that an air barrier to the interior in our situation will be impossible. So has taped CDX has still proven sufficient as an exterior air barrier. And is there anymore evidence that one solid air barrier, whichever side is enough? Also any thoughts or information about Henry Blue Skin as the sole air barrier to the exterior? I haven't heard of any new developments in the last 8 years to affect my opinions on the one-air-barrier-versus-two-air-barriers debate. If you are enclosing fluffy insulation like fiberglass, you need to pay attention to all six sides of the assembly. You've taken care of the exterior of the wall sheathing. You can't do anything -- or more accurately, you can do very little -- about the interior side, unfortunately. So you should focus on the bottom (all the cracks near the bottom plate) and the top (all the cracks near the top plate) of your 2x6 wall. Perhaps you can connect the exterior sheathing to the foundation with peel-and-stick -- in a way that covers the cantilevered 2x6 bottom plate. I'm not sure what the top of your 2x6 assembly looks like, but perhaps you can seal the 2x6 top plate from the interior of the stud bays, by installing 1 inch of closed-cell spray foam on the underside of the top plate (inside the stud bays). Any visible cracks you see should be sealed as best you can, to try to make up for the blunder of the missing interior air barrier. Is 1" of closed-cell spray foam flashing the inside of the top plate enough to prevent any risk of condensation of moisture on the inside of that foam? The low vapor permeability of closed cell foam prevents excessive seasonal moisture accumulation within the foam itself. 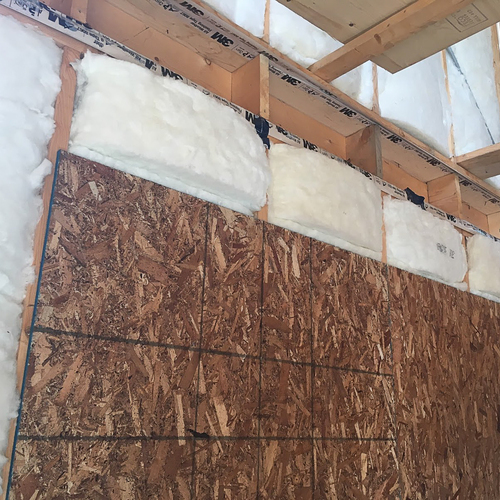 The climate, and the ratio of the foam R+ framing R to the R value of any air permeable insulation between the foam and conditioned space determines the risk of moisture accumulation at the foam/fiber insulation boundary. An inch of closed foam on it's own is good enough for 3.5" of fluff in US climate zone 5 or lower. Presumably, the stud bays are filled with cellulose. What is above the top plate of this stud wall? Attic insulati0n, perhaps? In most cases, the top plate of a wall is not exposed to exterior temperatures, so you shouldn't have to worry too much about moisture accumulation on the interior side of the cured spray foam. If you are able to install some closed-cell spray foam on the interior side of the top plate of the cantilevered wall, there will be two benefits: air sealing and reduction in the chances of condensation or moisture accumulation. So if you can do that, go ahead -- and don't worry. Great! Will do. Thank you.